We’ve all had that moment. You committed to reading the Bible, but you have no idea where to start. Maybe you got a few verses in, and you started tripping over words you’ve never seen, metaphors you didn’t understand, or lists that didn’t make sense. Maybe you’re wondering if you made a mistake, or you’re so overwhelmed you’re ready to give up. God promises that His Word will not return void (Isaiah 55:10 11). You can do this, and the time you spend reading the Bible will not be in vain. As we read the Bible, we learn where we came from and why we are here. We gain wisdom for how to live and understanding about what happens when we die. When you pick up the Bible and start reading, you may not understand everything but you will always- learn something. The Bible was written by God Himself through human beings (2 Peter 1:21). The Bible is God’s voice, and it is the primary way He chooses to speak to us. 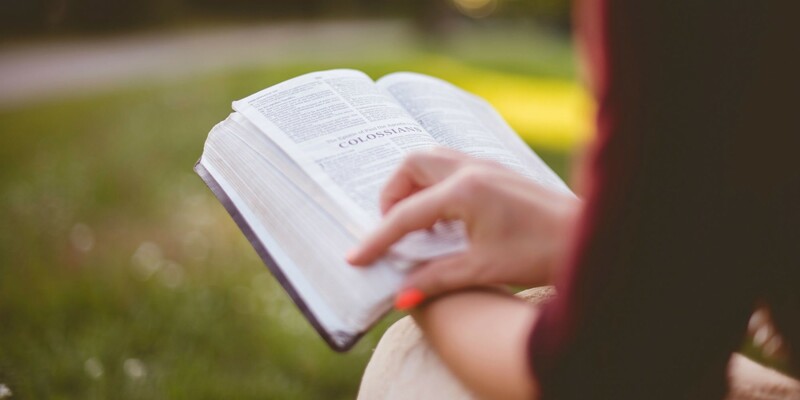 His written word gives us certainty about what God wants for our lives (2 Timothy 3:16-17), and it’s the only reliable way to learn who God is and what His character is like. The more we know God, the more we want to be like Him. Just like we wouldn’t have relationships with our children or spouses without communicating with them, we can’t have a relationship with God without hearing from Him either. As we continue to read the Bible throughout our lives, our relationship with God grows, and we develop greater and greater trust in Him. We will know we can rely on Him as we obey His commands and seek His guidance in all areas of our lives. You can start reading the Bible anywhere, but it might get confusing if you jump in randomly. The Bible is about Jesus. His name might not be found on every page, but the Bible can basically be broken into three parts centered around Him: life before, during, and after Jesus’ time on earth. Getting to know Jesus helps us see Him in the rest of the story. The first half of the Bible, Genesis through Malachi, is called the Old Testament. It tells the story of life before Jesus and looks forward to His arrival on Earth. The second half, Matthew through Revelation, is called the New Testament and describes Jesus’ life, ministry, and mission. The more we know God, the more we want to be like Him. While Jesus lived on Earth, He had a group of close friends called disciples. Four of the disciples — Matthew, Mark, Luke, and John — recorded their accounts of Jesus’ life and teaching in the first four books of the New Testament. These four books are called the Gospels, and they are the best place to start reading the Bible. What if I Don't Understand? Don’t be afraid to ask questions. You will come across words or phrases that don’t make sense at first. If you have a personal relationship with Jesus, you have a personal relationship with the author of the Bible as well (Romans 10:13, 2 Timothy 3:16). Ask God to help you understand what you’re reading, and ask friends who’ve been following Jesus longer to help you understand. 1. Consider who these words were written to. Some books of the Bible are written as history, others are letters to specific churches, and others are letters to specific people. Identifying the original audience of a book will help make things clearer. 2. Consider what kind of writing it is. Not all writing is the same. You wouldn’t send a text message to a friend with the same writing style you would use to hand write a letter to your grandmother. In the same way, the authors of the Bible used different writing styles, like poetry, narrative, and prophecy. The Bible isn’t meant to confuse you, but sometimes it does, and that’s OK. Keep reading. The more we read, the better we get to know God. And the better we get to know God, the more we understand what we’re reading. “Give me understanding, so that I may keep your law and obey it with all my heart. Direct me in the path of your commands, for there I find delight” (Psalm 119:34-35).